Last night was my first Fit For Real People class and I’m very excited about it. 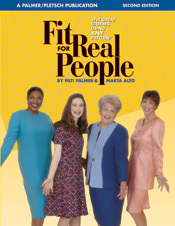 If you’ve never heard about Fit for Real People, it’s a pattern fitting method designed by Palmer Plestsch that uses tissue fitting. There’s a good book on it and they offer classes and workshops. I am lucky enough to live in the city that is home to the Palmer Pletsch Sewing School – Portland! Palmer Pletsch does a 4 day workshop to teach their fitting technique but it’s during the week and costs $700. Ouch! However people do come from all around the country and the work to take this class so it must be good. While browsing around I found they offer a workshop for locals that’s only $105! It’s a 4 week class that meets for 3 hours each week but covers the same topics as the workshop. The Palmer Pletsch Sewing School is located in fabric mecca, aka Fabric Depot. There’s are large classroom and our class had 8 women. Most of the beginning of the class was spent discussing pattern sizing and the history of patterns and it was obvious our instructor Marta Alto was extremely knowledgeable about sewing. By my calculations she’s been doing this professionally for nearly 50 years…although she doesn’t look nearly old enough for that. Then she measured everyone’s high bust line and told us our starting size. Mine was one size smaller than I usually cut. Then one by one she fitted us in bodices made of gingham. For each size there were bodices adjusted to cup sizes through DD. On each person Marta pointed out where it fit and what adjustments needed to be made. It was particularly interesting because 4 people in the class were the same size but were totally different shapes and needed different adjustments. I ended up being 2 sizes smaller than I would normally cut. My adjustments would be the high round, broad back, full bust, and waist. Marta said nearly everyone these days needs high round (yay computers!) and waist. The good news was she said my back was very flat. I guess my posture is better than I thought! 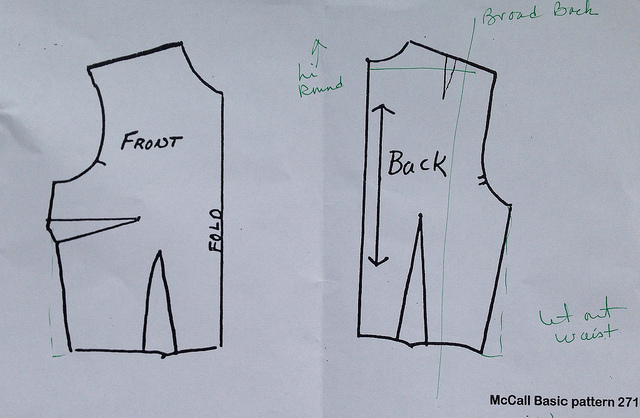 Our homework is to select a top, dress, or jacket pattern and prep it for tissue fitting next week. The only rule is it can’t have princess seams. 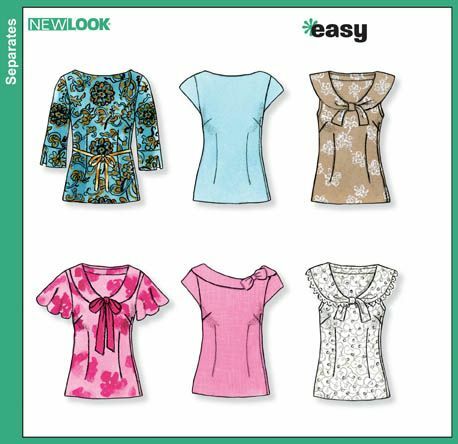 I dug through my patterns when I got home and picked the pink bow blouse from New Look 6808. We are going to do 3 patterns plus a skirt so I need to start thinking of what else I want to make! I can’t wait to see how these turn out.